Who wants to repeat losing the Super Bowl?! Hey, I’m a Browns fan. I’d love just getting there. If anyone deserves it its Browns fans. Nobody is more loyal. I’m still bothered by how the Browns organization behaved when Art Modell passed away. That was an opportunity to heal some deep wounds but they fumbled it away. He hasn’t been the same player but man, this is a good landing spot for him. Playing behind that fantastic defensive line is going to help offset whatever pass rush ability he might have lost the last couple of years simply because there are other guys the offense has to worry about blocking. Very similar to Chris Long signing with New England then Philly. Matthews will have a great year in L.A. as a situational pass rusher. Won’t be surprised to see him get double digit sacks again. Happy for him! Despite his decline in GB over the last few years, I love that he NEVER stops. Even when he seems like he’s out of the play, he’s still pursuing. It’s certainly a very strange day or so. 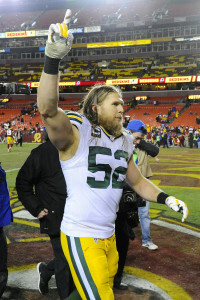 Clay Matthews was my favorite player on this team, as I like defense. When he was on, he was a monster. As others have said, even in his decline, he finished every play and gave it his all. Also agree it’ll be strange to not see Cobb out there. Hard to think of the team without these two and Jordy. But I suppose it’s a step into the future. 13 million to Cobb and Matthews…two guys who haven’t been able to run in three years. Comically insane by Dallas and LA. Matthews played on a horrible defensive unit in GB, he’ll be a solid addition in LA. The Bears/Packers rivalry became a great one because of players like Clay Matthews. The guy always gave his best for Packer fans and he brought out the best in our players. Wish him the best with the Rams. He’s probably a bit better than average now, but with a D like the Rams have with those guys up front, he could actually look like the old Clay. A lot of effort but the results just weren’t there for the Packers. His stats may have been better if the Packers had better players throughout the Defense.